BEIJING, China (CNN) -- Five major mosques near the center of violence last weekend in Urumqi, the capital of China's far-west Xinjiang region, were closed Friday morning, state-run media reported. A Chinese Uyghur man opens the gate to a mosque in Urumqi on Thursday during a media tour. 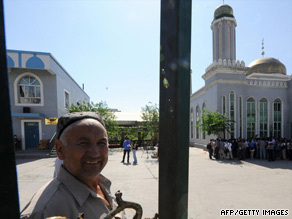 Same smaller mosques in the city remained open, according to the Xinhua news agency. "Mosques in some sensitive areas were closed at their imams' suggestion," an official in charge of religious affairs with the Xinjiang regional government said Friday. "Muslims normally perform rituals at home in time of plague or social unrest." Friday is the main day of worship for Muslims. More than 1,400 suspects have been detained, according to Chinese officials, who have vowed to deal harshly with those involved in Sunday's riot. "For those who brutally killed the other people in the riot, the government will execute them," Urumqi's Communist Party leader, Li Zhi, said Wednesday. China's chief police officer, Meng Jianzhu, said the main instigators "should be punished with the utmost severity," while others who were "provoked" to take part in the riots "should be given persuasion and education," according to Xinhua. Police have detained 15 suspects in connection with that incident, Xinhua reported. As a result of the violence, Chinese President Hu Jintao cut short his trip to Italy for the Group of Eight economic summit. China was invited to attend as one of the world's emerging economic powerhouses. The violence is a result of ethnic tensions between the Uyghurs, who are predominantly Muslim, and members of China's Han majority. Hundreds of Han Chinese were on the streets of Urumqi on Tuesday, holding sticks and pipes and calling for severe punishment of the Uyghurs, who they say committed serious crimes. The Uyghurs say they have been victimized and many of those killed in the violence Sunday were Uyghurs. Uyghur religious leaders have condemned the violence, saying it is against the spirit of the Muslim faith and Uyghur tradition. That violence took place late last month at a toy factory in Guangdong province, where many migrants, including Uyghurs, have moved in search of work. A massive brawl reportedly broke out between workers of Uyghur and Han nationalities. Two Uyghurs reportedly died.